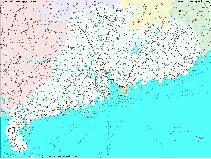 The Guangdong Province Maps Index gives acces to all Maps relevant to Guangdong Province and Area's of Specific Interest within that Province, as used and/or produced by ChinaReport.com. Please use these Maps to find your way easily around the Province, Cities, Area's and many Monuments & Landmarks. 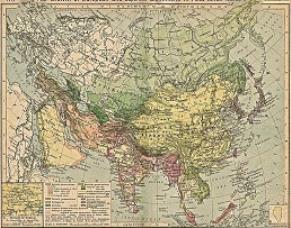 Geographic Maps of the Han Empire, the Yuan Dynasty & Mongol Empire The 13Th Century Trade Routes, Todays Pollution Clouds and more ! 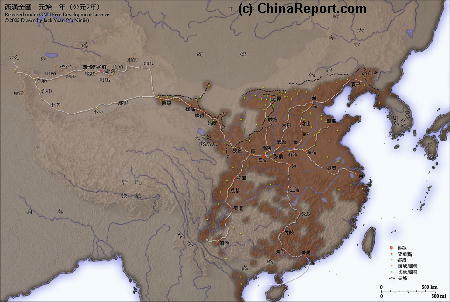 A Schematic Map depicting the Full extends of the Han Dynasty Empire and its trade relations with neighboring States and Neighboring Peoples and Tribes. 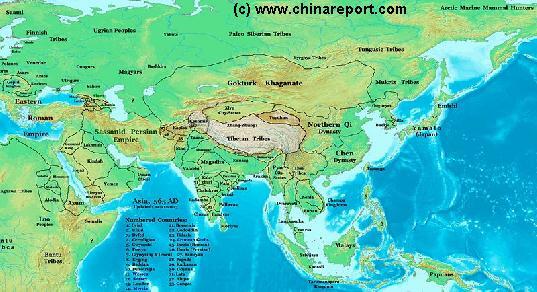 Marked on the Map are the locations of Main Cities of the Han Empire, Han Military Garrisons and Strongpoints, locations of Tributary States (mainly in the West) and the Pathways of Sections of the Great Wall of China constructed during the Han Dynasty Reign Era. Special Links provide access to additional information on each individual site. A Full Google Earth Supported Map of Guangdong Province by Google.com. The China Report introduced on Levels of its Online Publishing's in April of 2009, including Guangdong Province. 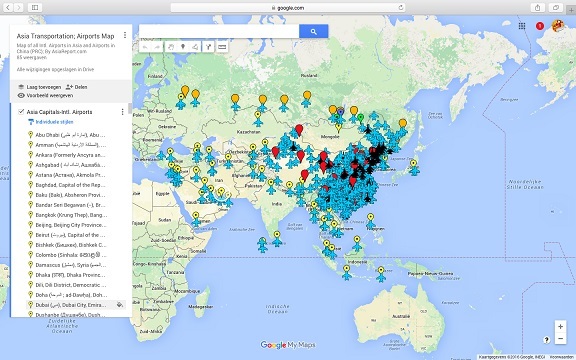 Adjacent Map gives direct access to Map Of Guangdong Province by Google. A Schematic Map of the Mongol Empire of Genghis Khan (TeMuJin) and descendants through its several stages of conquest in its short but Impressive Existance in History. Timeline depicts the Mongol Conquest starting in the Year 1206 AD, when Genghis Khan first united the Mongol-Turkic Tribes of Mongolia and Lake BayKal becoming Great Khan. The Timeline continous through the year 1219 AD, the year 1223 AD taking Transoxiania, 1227 AD, 1237 AD when the Northern Jin Dynasty of China was annihilated, 1259 AD conquering ancient China above the Jiangste River and 1279 AD when all of China was taken and the Yuan Dynasty Eastablished under the Kublai Khan. Last is the Year 1294 AD when the Mongol Empire reached its largest geographical size and Zenith, 22% of world land area, but through lack of central leadership and over-expansion fragmented into 4 large parts, then imploded upon itself. A Schematic Map of the Eurasian Trade Routes existing in the 13Th Century. 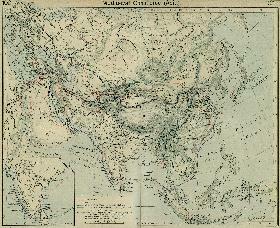 Clearly marked in Red Accent on the Map are the cities of the network of land-bound trading routes through Central Asia known as the Silk Road (the path of Marco Polo and others). Marked in Blue Accent are the Main Ports and Harbors of the Maritime Trade Routes that operated between the Arabian Peninsula and the Red Sea, the Indian Ocean and Coastal Cities, the Straights of Malacca, the South-China Sea's and beyond. As shown Maritime Trade to China mainly entered through Southern Harbors, then was distributed internally by use of the Grand Canal, the Yangste River and the Yellow River. 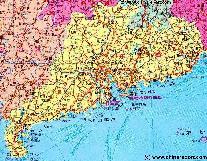 A Geographic overview Map of Guangdong Province entire delineating provincial borders and Main Landscape Features in Guangdong and parts of neighboring Hunan in the West, Jiangxi Province and Fujian Province in the North and Hainan Island in the South. This Map Includes Hong Kong and Macau Special Administrative Zones (SAR), Main Cities and Towns (shown by size), Main Monuments & Landmarks of Guangdong Province, the flow of the Pearl River and other main rivers, Deserts, Mountains (with Height), major highways, provincial railroads and main railroad-stations, and waterways & rivers. This Map further provides links to on site photos and information on the Cities and Monuments. 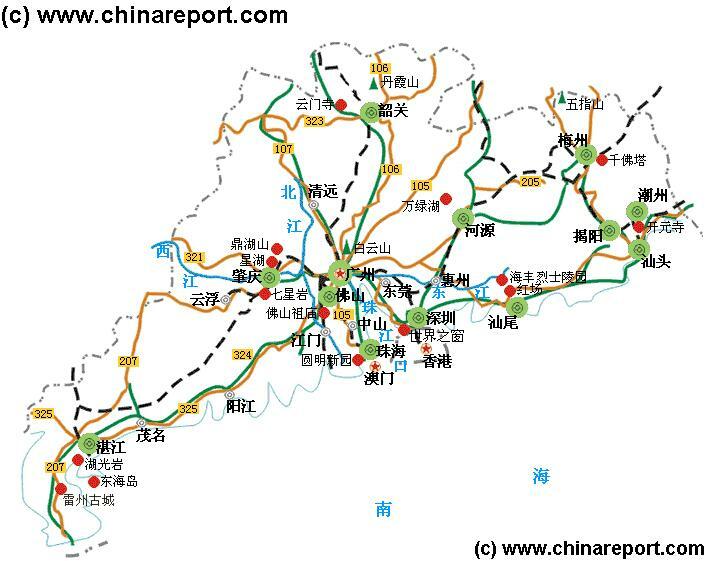 A Schematic overview Map of Guangdong Province entire delineating provincial borders and Main Lines of Communications in Gaungdong and parts of neighboring Hunan in the West, Jiangxi Province and Fujian Province in the North and Hainan Island in the South. 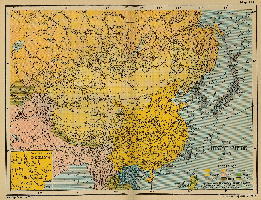 This Map Includes Hong Kong and Macau Special Administrative Zones (SAR), Main Cities and Towns (shown by size), Main Monuments & Landmarks of Guangdong Province, the flow of the Pearl River and other main rivers, Deserts, Mountains (with Height), major highways, provincial railroads and main railroad-stations, and waterways & rivers. This Map further provides links to on site photos and information on the Cities and Monuments. 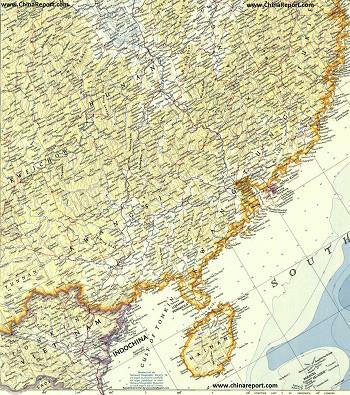 A Schematic overview Map of Guangdong Province entire delineating provincial borders and Main Landscape Features in Guangdong and parts of neighboring Hunan in the West, Jiangxi Province and Fujian Province in the North and Hainan Island in the South. 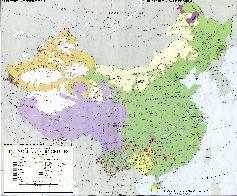 This Map Includes Hong Kong and Macau Special Administrative Zones (SAR), Main Cities and Towns (shown by size), Main Monuments & Landmarks of Guangdong Province, the flow of the Pearl River and other main rivers, Deserts, Mountains (with Height), major highways, provincial railroads and main railroad-stations, and waterways & rivers. This Map further provides links to on site photos and information on the Cities and Monuments. 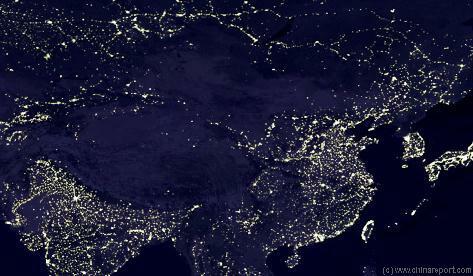 Locations visible lie roughly between Kabul-Afghanistan in the West, Osaka-Japan in the East, Krasnoyarsk in the North and Sanya on Hainan Island in the South. Find the large coastal cities and main Chinese Civilization Centres on the Chinese Plains between Beijing i/t North o/t Plains and Hong Kong and Guangzhou (Canton) in the Extreme South. Follow the Flow of the Yellow River and cities and towns strewn along it from Xining-Qinghai Province, through Lanzhou-Gansu and Yinchuan-Ningxia to flow along the Western Shanxi Province Border and find the black holes created by the Gobi and Taklamakan Deserts as wel as Tibet-Qinghai Plateaux. 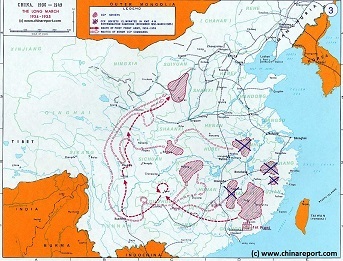 A Schematic overview Map of the current Peoples Republic of China depicting the main route(s) of the epic Long March of 1934 and 1935. 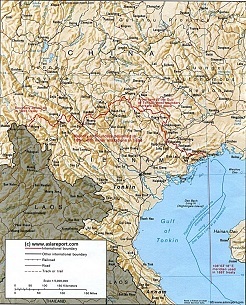 Map clearly delineates PRC China current National borders and includes Provinces and Autonomous Regions, Main Cities and relevant Towns, initial Communist Soviets (Self-administered rebel areas), the routes followed by various elements among the Communist Groups and Armies, locations of important meetings points, main natural obstacles such as mountain ranges, the flow of large rivers such as the Yangtze River and Yellow River, position of the Great Wall of China in Gansu Province, Ningxia Hui Autonomous Region, North Shaanxi Province etc, rough estimated routes of main railroads of the time and other details of interest. Mouse over locations and link through for additional information on each location.